Last week, we wrote about workplace investigations. We explained how employers have an obligation to ensure a fair and thorough investigation and how bringing in a competent and neutral third party, like an employment lawyer, can help achieve this end. Now, we’d like to talk about workplace investigations from the employee’s perspective. In particular, we’d like to focus on employee’s rights during an investigation. If you’re a fan of police procedural shows like Law and Order or anything from the CSI franchise, you know of the Miranda Rights. You know, the you have the right to remain silent, you have the right to an attorney stuff. Maybe you’re wondering if these same rights apply if you’re involved in a workplace investigation. First of all, we do not have Miranda Rights in Canada. You do have similar rights if you are being arrested – namely the right to know why you are being arrested and the right to speak with a lawyer. However, being involved in a workplace investigation is not the same as a police investigation and neither are your rights. If you have been accused of improper workplace conduct – theft, harassment, fraud etc. 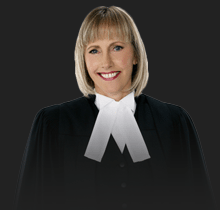 – you might expect to have at least the same rights as if you had been arrested for a crime in terms of procedural fairness. You would be wrong. If you are involved in a workplace investigation, you will not necessarily get to know who your accuser is or respond to them. You also may not even be told the evidence against you. You can even be terminated without being told why or given the opportunity to submit your own defense. 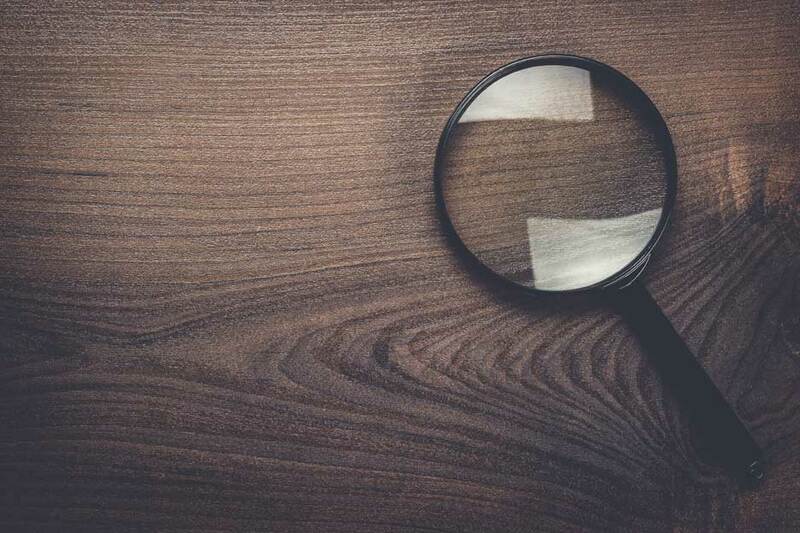 Of course, employers must do everything in their power to conduct a fair and thorough investigation and failing to do so is at their own risk. However, employees should note that their rights are contractual. That is, you are entitled to the basic laws governing dismissals under the Employment Standards Act. Nevertheless, you can be terminated without cause at any time so long as you are given proper notice or pay in lieu thereof. While you certainly have the right to contact and consult a lawyer in your personal time should you find yourself the subject of a workplace investigation, you are not entitled to have a lawyer or anyone else present during a workplace investigation interview. This isn’t a police investigation; you don’t get that proverbial one call. If you are part of a union you may have the right to the assistance of a union representative, but otherwise you do not have any right to counsel. Again, you haven’t been arrested, and you therefore do not have the right to remain silent. As an employee, it is your duty to cooperate with any workplace investigation. Silence on your part during an interview can be taken as insubordination and can reasonably lead to disciplinary actions against you. Additionally, if you refuse to answer question, your employer will not have, and therefore will not take into account, your side of the story. Employees have a general right to privacy in the workplace unless it is explicitly stated otherwise in their employment contract. 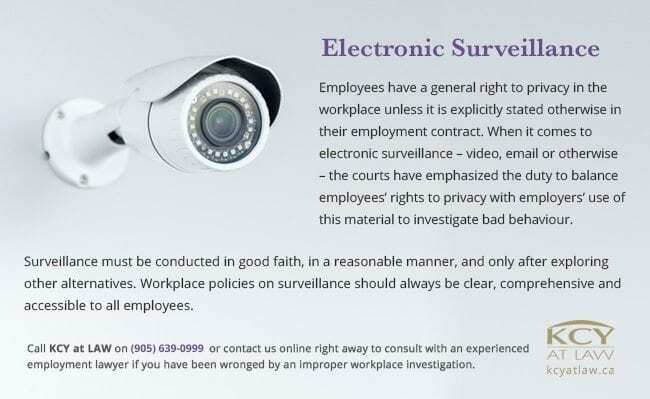 When it comes to electronic surveillance – video, email or otherwise – the courts have emphasized the duty to balance employees’ rights to privacy with employers’ use of this material to investigate bad behaviour. Surveillance must be conducted in good faith, in a reasonable manner, and only after exploring other alternatives. Workplace policies on surveillance should always be clear, comprehensive and accessible to all employees. Employees have the right to a timely investigation. Employers must do their best to promptly initiate and investigate in response to complaints and allegations of wrongdoing. They must also implement disciplinary actions in a timely manner. If an employer has delayed such things and an employee files a legal complaint, arbitrators will look at the delay’s length and impact and measure this against the reason for the delay. Even though employee’s rights seem limited during a workplace investigation, you still have the right to a safe and fair work environment. 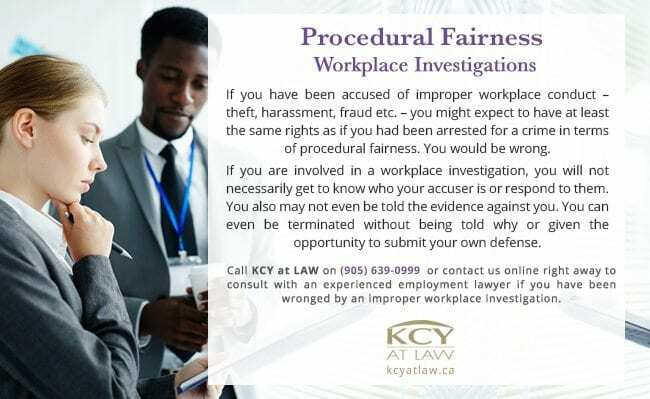 Call KCY at LAW right away to consult with an experienced employment lawyer if you have been wronged by an improper workplace investigation. Call us on (905) 639-0999 or contact us online!